I like curries of all sorts and I am constantly looking for new ways to enjoy curry. A while ago I came across a recipe for curried honey dijon roasted chicken that sounded good. It is basically a recipe for honey and dijon chicken with some curry. I had been wanting to try honey dijon chicken as well and I thought that the idea of that amazing curry aroma and flavour could only make it better. I was sold and it quickly made it to my meal plan. Though I liked the look of the sliced chicken breast with the golden brown outside and white inside I decided to go with chicken thighs with the skin and bone as they have more flavour. This chicken was really easy to make; you just have to mix the marinade and let it marinate and then roast it in the oven. Pretty much all of the hard work is in the waiting. The curried honey dijon roasted chicken turned out really nicely. The chicken was moist and tender and full of flavour. I really liked the combination of the curry, mustard and honey and they balanced out well. I garnished the chicken with some chopped cilantro and served it with some coconut butternut squash and sauteed chard with raisins and pine nuts . Mix everything but the chicken in a bowl. Add the chicken, cover and marinate in the fridge for at least an hour. Place the chicken in a baking dish (reserving the marinade) and cover with foil. Bake in a 375F/190C oven for 20 minutes. Remove the foil and brush on some of the marinade. Bake uncovered until the juices run clear, about 20-30 minutes, brushing with the marinade periodically. I’m liking the crispy skin! Curry + dijon + honey interesting combination! The curry and honey sound great together. I’m sure this would work for many dishes. Your chicken looks great!!! I’ve never thought of adding some curry to honey dijon. Great-looking chicken you’ve got there! That look really delectable, and curry and honey dijon is very unusual combination. What great colour you got on your chicken. So glistening and inviting. Curry sounds like a great addition to honey dijon. I love the honey-curry combination! It looks absolutely delicious! I agree, it’s very unusual but the combination sounds quite enticing– looks smashing too. A great east-west fusion here! Kevin, I love curries as well. This sounds like a great combination of flavors. I guess this is a recipe to bookmarked. Hi, We are a media company called NewsLink Services. Our aim is to keep the seafarers in touch with all that is happening even though they are at sea. For this we come out with an infotainment CD every quarter. It has various sections like recipes, lifestyle, health, games etc. We wanted to use the photos and the recipe. Alternatively you could send us three of your best recipes with photos. Due credit will be given to you. And if you want your photo can accompany the recipes. That looks so good Kevin! I have a similar recipe. Curry, chicken, honey, mustard . . . you CANNOT go wrong with this combination! Well done! I’m so glad you enjoyed the recipe…and put your own spin on it!! It’s such a good combo of flavors! Thanks for linking back to my blog. Have a great weekend. Love the crispy skin! The picture is amazing. An interesting combo too. Hi Kevin I saw this on Tastespotting and it caught my eye right away. Then I saw it was you! Of course another great recipe from Kevin! Thanks! ooooh…looks scrumptious! I will be trying this one day soon! Love this – I bet this was absolutely delicious!!! I just found your website and bookmarked it. All your dishes look very impressive, yet when I look at the steps, seem very easy to execute! This looks absolutely incredible – gooey and crispy all at the same time. The flavour combos sound really good. I’m getting hungry just reading this. What a great combination – The photo of the finished product speaks for itself!! This looks so good! I’m always looking for new ways to cook chicken. Chicken is so versatile but can easily be boring if you make it the same way, time after time! This is a really interesting and creative idea! This will be dinner tonight. Thanks so much for sharing! WOW! Those thighs look good. And, so easy to do. Thighs are my very favorite part of the bird, the most flavorful in my opinion. Those sweet-spicy flavors sound great to me – looks so delicious too. Looking forward to trying this one soon! I just made a curried chicken salad. Your roast thighs look terrific, a nice easy weeknight dinner. I will try them soon! Yum yum yum… your roast chicken looks real good… i like the crispy skin!! Curry and honey dijon sounds brilliant! OMG that pic of the chicken and blistery and bubbly is divine! Just found your blog. I love the idea behind it. Finding new foods keeps life interesting! I can just imagine the flavors all mingling together. I love the flavor of chicken thighs. I’ve been using a lot of dijon on fish and chicken lately, and it’s great for adding tons of flavor without tons of ingredients! Fantastic combination — the skin looks so tempting, though I’d remove it before eating. Nice! Great combo of flavors. And I like your banner Kevin! Perfect!! I just bought some chicken thighs too! So you’ve totally helped me come up with a complete meal! What an amazing looking dish! I love chicken, espeically when there’s honey in it! That looks delicious! great blog! I too love curry, and there is just something special about honey and curry. yumm!Good-looking chicken skin! it’s my favourite part! That looks amazing! I’m going to have to make it. Oh yeah crispy skin with that sauce! Oh yeah! This looks great. I have all the items in my house. I think I’m going to make these soon. I always roast chicken thighs with honey, dijon mustard and lemon juice, but your version with curry powder sounds really interesting! I’m gonna give it a try tonight! Curry is always good, great looking chicken! I made this for dinner last night and it was mouthwateringly delicious (and super easy)! I didn’t believe that it would be enough marinade for four chicken thighs, but when I put them all in a ziploc bag to marinate, it was more than enough. Thanks! Great combo Kevin, this looks especially good! I just used 3 of your recipes, the chicken was amazing!! Thank yoU!! 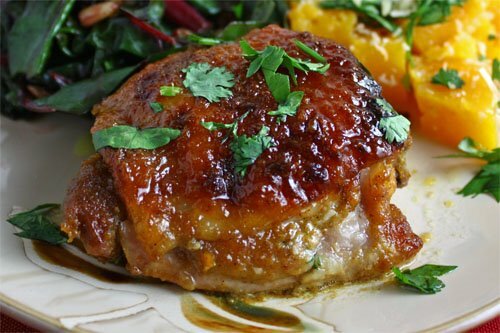 Now that we are on a fixed income, I’m always looking for recipes that use chicken thighs (though we both prefer breats). This recipe was excellent. Perfect for a busy nurse like myself to come home and make for her retired husband who puttered about all day. LOL! I’ll let you all know how delicious it is! I’m sorry, that picture is pure food p0rn! So refreshing to see somebody other than me actually chooses thighs over bland breast meat and eats the skin (the best part!). Bookmarked. I forgot to tell to that the closet is a terrible place to be. I should know, our son took a terribly long time to “come out” of the closet, due to my husband’s hostilities. But eventually Chuck got over it and Chuck Jr. is living a happy life. The unusual combination of honey, curry, and dijon mustard was WONDERFUL! I just HAD to come back here and leave a comment. I made this the other night for my husband and I and it was INSANELY GOOD! I followed the recipe except that I used bonesless, skinless chicken breast, cooked with foil on until the last 15 minutes or so. DELICIOUS!! Just made this tonight and it was so incredibly good! My husband loved it too and he is not a fan of mustard (only told him about the dijon after the fact and he was surprised). One of the better chicken dishes I’ve had – thanks so much for the excellent recipe! I just made this for dinner tonight and it was so delicious! I made this for dinner last Thursday. It is wonderful! The picture looks much better than mine did. It was a pretty dish but I wish it had more a glazed finish. This is definitely being added to my arsenal. THANKS! Best family friendly curry ever! This is now my go to recipe. Thanks! I made this for dinner last night and have to say it's pretty awesome. I used a country style dijon and added baby carrots to the pan, letting them roast in with the sauce. Just a wonderful dish and I love the curry!